The Good Relations team at Causeway Coast and Glens Borough Council is organising a series of visits to historical and cultural venues within the Borough and beyond to encourage understanding of the diversity of people and places which make up our area. 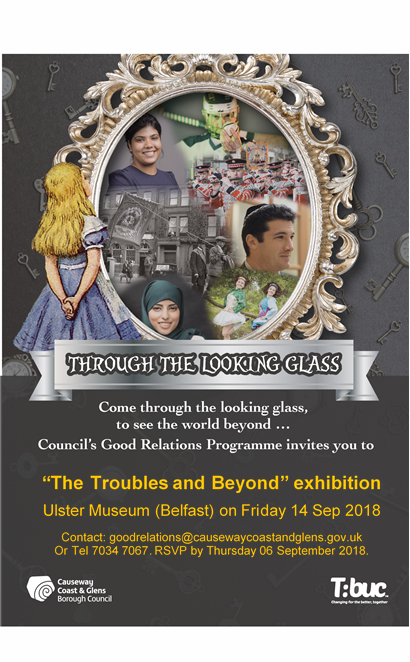 The programme, entitled “Through the Looking Glass” will provide opportunities to explore a variety of cultures, traditions and faiths throughout the year. The first two events have been timed to coincide with Good Relations Week, starting with a visit to the Ulster Museum Belfast to see “The Troubles and Beyond” gallery and participate in discussions about the different historical and political perspectives displayed. This will take place on Friday 14th September and transport will be provided from Coleraine with stops in Ballymoney and Cloughmills. The exhibition acknowledges that while we have a shared past, we do not have a shared memory and it seeks to ensure a diverse and inclusive approach, with many objects and personal stories to be investigated. This visit and the facilitated discussion will provide an opportunity for people to reflect on how the exhibition has affected them and to learn from each other’s perspectives on this turbulent period of history. 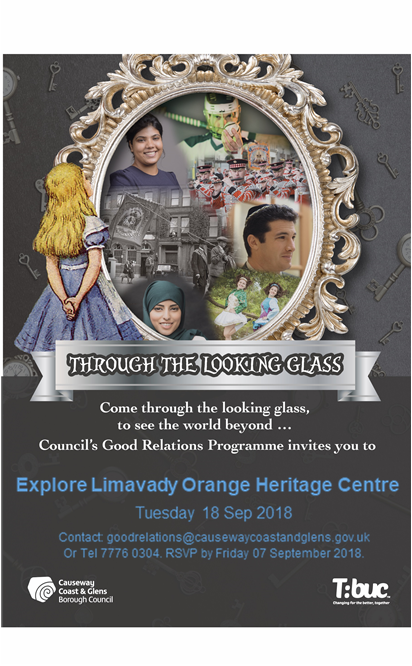 On Tuesday 18th September participants will have the chance to explore the Limavady Orange Heritage Centre (transport will be provided). The visit will include a tour of the centre and an introductory presentation by the Grand Orange Lodge of Ireland on the history of the Orange movement and why the Order still exists today. All events are free of charge, but places are limited, so if you would like to register for either of these visits, or be notified of future “Through the Looking Glass” events, please contact goodrelations@causewaycoastandglens.gov.uk or call Joy on 7034 7067 or Amy/ Lorraine on 7776 0304. If transport is a difficulty for you, the Good Relations team will make every effort to ensure that you can participate. A visit to The Ulster Museum in Belfast has been organised as part of Good Relations Week to encourage understanding of the diversity of people and places which make up our area. The visit to Limavady's Orange Heritage will include a tour of the centre and an introductory presentation by the Grand Orange Lodge of Ireland on the history of the Orange movement and why the Order still exists today.